I first noticed Spencer Wall in my religion and society class toward the end of last semester. She wasn’t particularly outspoken, but the shawl that covered her hair, neck and shoulders made her stand out in the large class. I usually gave her nothing more than a completely unconscious glance. But when she revealed to the class the decision that she made on April 27, I suddenly became aware of the attention I gave her. Wall, a 20-year-old sociology and English senior, decided to assume the characteristics and attire of a “typical” Muslim woman for a year starting in late April. She wears the traditional veil, or “hijab,” and loose-fitting clothing everywhere she goes and does not consume pork or alcohol in public. She avoids eye and physical contact with men and has adopted modest habits like walking with her arms glued to her sides or crossed in front of her to hide her chest. I witnessed the looks Wall gets on a daily basis when we met at Kerbey Lane on the Drag recently. 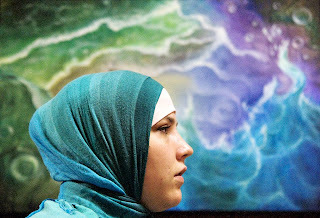 She’s wearing a hijab splashed with vibrant shades of green and blue. A long-sleeved, black shirt and floor-length aqua skirt reveals only a few inches of skin. Some who pass us try to be inconspicuous with their intrigue, limiting themselves to quick side glances. But most don’t even try to be candid with their exaggerated double-takes or blatant stares. Great read...where do you find this stuff? I reverted a year ago, im not white anyway so i dont stand out as a revert but i really understand when she says she always gets glances and stares i find this fustrating but i like not being judged and other girls cant look and compare themselves to you. And i know i look modest and respectful unlike them. Obviously she'll get people looking at her. One gets the same curiosity when dressing following western fashion in countries where more modest attire is the norm. I do a double-take sometimes when a very fashionable woman walks past. There's nothing wrong with curiosity. And what's with 'walking with her arms glued to her sides'? Weird. Maybe their staring at her cuz she's walking with her arms glued to her side. :O Sorry, couldn't resist. Anyway, thanks for the article and love your blog. This is an awesome article, mashallah!! She is half way there. InshaAllah, Allah will change her heart and she become muslim. Covering is the hardest part for some sisters. May Allah guide her to this deen. Ameen. it's great that she tried this and has more respect for muslims and her own religion now. i hope she does convert one day isA. to be honest: "Her eyes momentarily follow the outline of the brightly colored veil and then quickly move away. Instead of feeling sorry for Wall and assuming that the attention is warranted by feelings of resentment or fear, I soon wonder if the girl is instead intrigued by the hijab." I used to look at girls that wore the hijab before i reverted but only to see how they wore it and look at the colors. I tried not to be rude about it and was sooo very interested. Ohh goody, another random girl wearing hijab for a yr to "see how the other half lives". *rolls eyes*...sorry for being acidic, but c'mon it's getting old. VERY strange...and I'm not diggin' this article for this chick-ster. I've worn hijab for 10yrs, dress very very modestly and I walk with a free-flowing, arm swinging sorta movement. I also found it strange that she would walk around with her arms glued to her sides or crossed in front of her. I used to walk around like that when I was younger because I was so unsure of myself and had absolutly no self confidance. So honestly, I don't think someone will see that as a sign of modesty but as a sign of a low self confidance and shutting the rest of the world out. Alhumdulilah, that's not the case anymore for me, and I'm not like that anymore, Alhumdulilah. I haven't read the rest of the article, but will. I thought is was a good article, I think it's great that she did it and was able to learn something from it. Sometimes the only way to relate to someone else is to try to walk in their shoes. I'm a Christian & cover off and on and I feel really guilty when I don't. I have a few scarves and am trying to figure out a style that fits me. I really like the way Muslim sisters cover but, am scared to wrap mine the same way. Would you be offended if you saw me covered like you and then found out I wasn't Muslim? I wear loose and modest clothes and the shortest sleeves I wear go to my elbow,no jewlery, a tiny bit of mascara and gloss, long skirts or jeans with shorter dresses or longer tunics. Does anyone know of different covering styles? Tiffany Nicole: Not at all. LOL, some of my bestest are two Christian girls who wear their hair up and sometimes a scarf on their heads. They wear floral print jumpers with thermal tees underneath, and they carry a bible everywhere so I don't think a Muslim has ever been confused about them being Christian. the story of trying out "the other" in piecemeal for a spell is a little old and this one unfortunately perpetuates the image of the Muslim lady cowering at the presence of men, shrinking into herself to be "chaste". Ugh! I dread those who brag at the "good women" who run themselves into walls to avoid men as though we can't function in public without fear of being molested. It screams low self-esteem and bleeds a sense of not deserving to be out in the world because of gender. We don't need that. With all due respect, I think it's great and all that some non-Muslim women want to know what it "feels" like to be Muslim in the "public eye," but just how "Muslim" are they really going to "feel?" They know that when people stare and them and give them dirty looks, or even make rude comments, that it's not really their religion that is being attacked. They may feel "sorry" for Muslim women who have these experiences, but they don't feel the deep hurt or even anger that we experience. There is no personal insult, because they are just playing a part, basically. Also, I don't understand why a non-Muslim would want to wear hijab. I understand the move to be more modest, and I laud that. It would be wonderful if more women had the desire to be more modest. But my reason for wondering why a non-Muslim would want to cover in a clearly Muslim fashion is that in doing so, she is going to cause people to think that she's Muslims. Muslim women may walk up and start talking to her, giving her salaamz, etc. They will be very confused when she doesn't return the salaamz, or doesn't want to speak with them. Also, if a woman is wearing hijab, yet is doing something that Muslims don't do (say, having a glass of wine, or eating a pork sandwich), she is bound to get some nasty glares (and harsh words) from Muslims. There are ways to be modest without confusing the world about your religion. People should find those ways, and try to be sensitive to how their mode of dress may affect others (meaning: if you do not profess to a certain religion, understand that those who do may think that you do). I know Spencer. She doesn't "walk with her arms glued to her sides." I don't know where that's coming from. She doesn't drink or eat pork either, because she knows she is representing the Muslim faith.